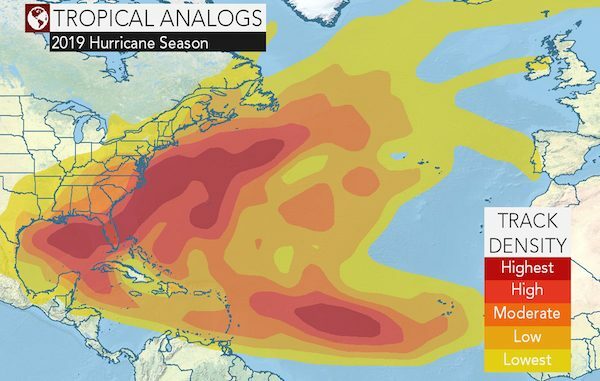 A heat map for the 2019 Atlantic Hurricane Season. SEBASTIAN – The 2019 Atlantic hurricane season is just around the corner and the AccuWeather forecasters are predicting a “near – to slightly above – normal season” with 12 to 14 storms. Kottlowski said that two to four are likely to become major hurricanes. After the U.S. took a battering in 2018, meteorologists are once again forecasting impacts for the United States. “To help predict the upcoming season, forecasters have drawn comparisons to previous years with comparable weather conditions – also known as analog years,” AccuWeather said in a statement. “But it shows you that this year, at least the climate pattern has the capability to produce several very strong storms and so people should not let their guard down,” Kottlowski said. Other years with similar forecast conditions have resulted in impacts from Brownsville, Texas, to the Florida panhandle and up the mid-Atlantic coast.